I love orange juice. It's like happiness poured into a glass. And the fact that it helps you heal from small colds? Amazing. You know what else I love? Projects that cost me five dollars or less and only take two hours to make. Particularly when they're useful. If you've already used one towel from your stash of wedding gifts for a hooded towel, then you've got one left for another little project, right? So try this one. 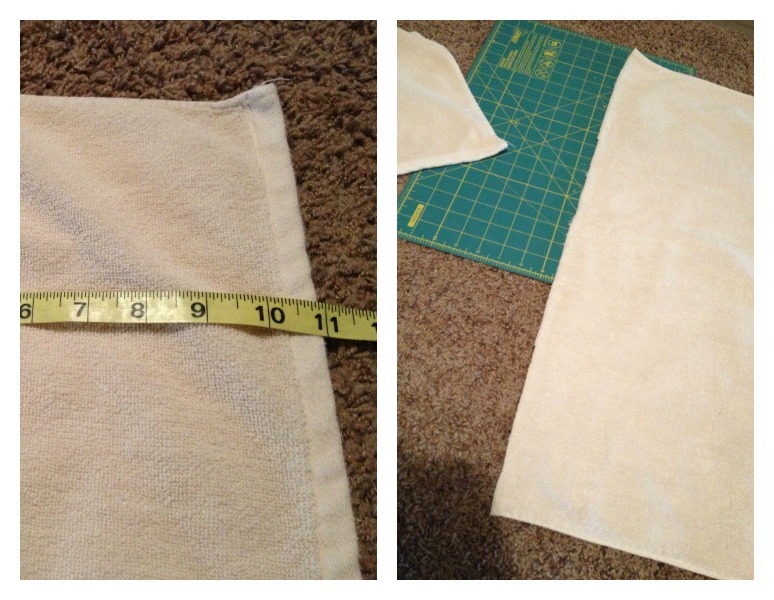 Step 1: Cut 11" off the top of your towel to get it to the right length (a.k.a. not dragging on the floor by your feet). 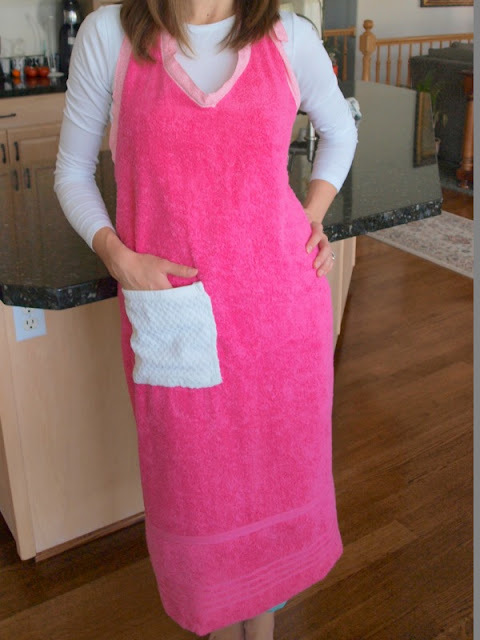 *The V-Neck towel apron is a little more complicated, but all you really need to do is cut the towel with a V-neck instead of straight across. Step 2: Fold your towel and apron in half. Place the apron on top of the towel, fold on top of fold, and cut from the chest to the ties. Step 3: Cut three pieces of fabric three inches wide and at least 45" long (just cut down the side of the fabric and it will be long enough). 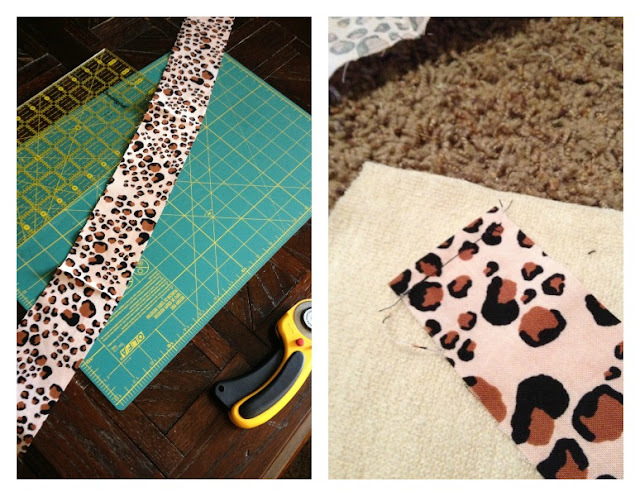 Fold the ends down on two strips of fabric and sew them down. 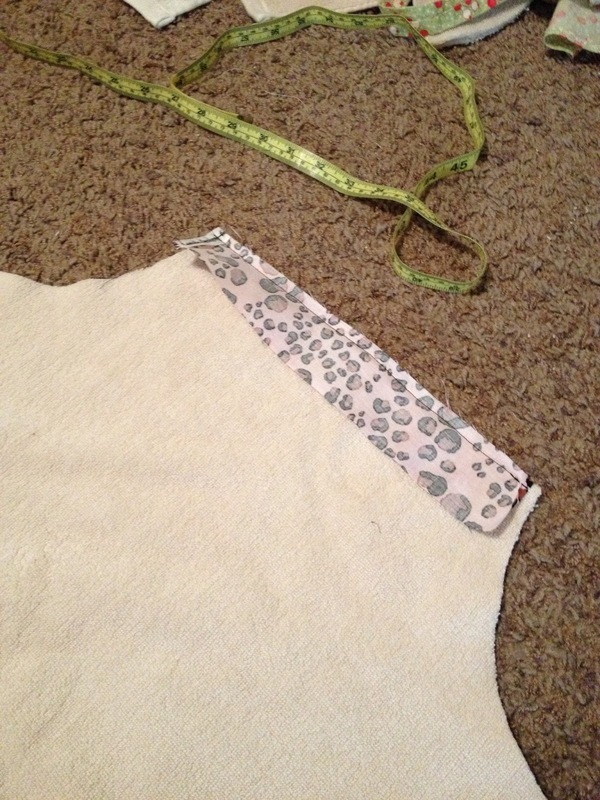 Step 4: Measure the length of the neck of the towel and cut your third strip to be just one inch longer. 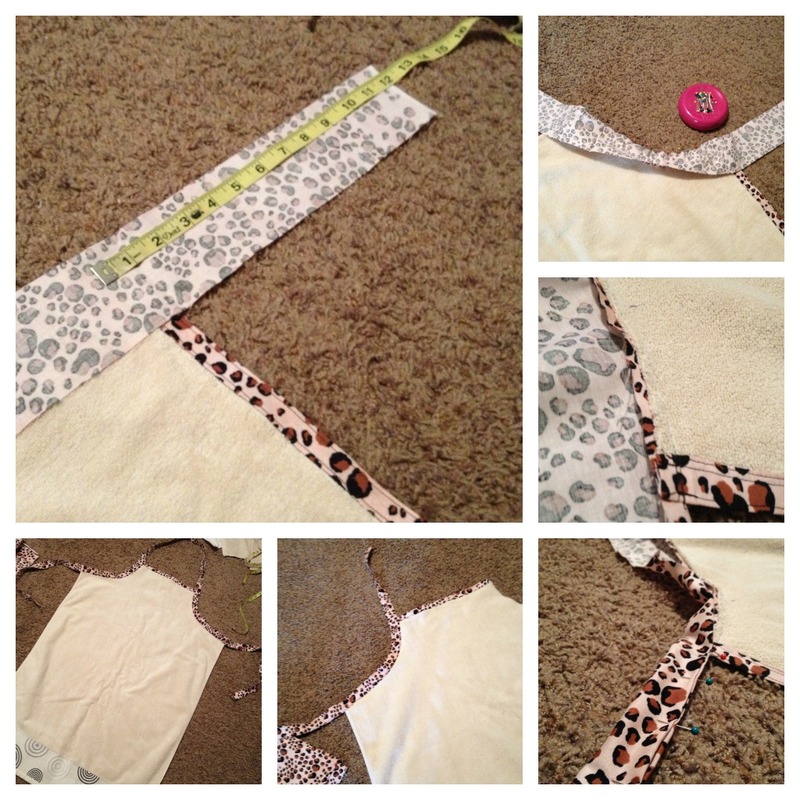 Fold the ends over and sew them down, pin the strip to the neck (right sides together and edges aligning), and sew with 3/8" seam allowance (you're making a bias). Step 5: Fold the fabric over to the opposite side of the towel neck, fold the edge under and pin in place. 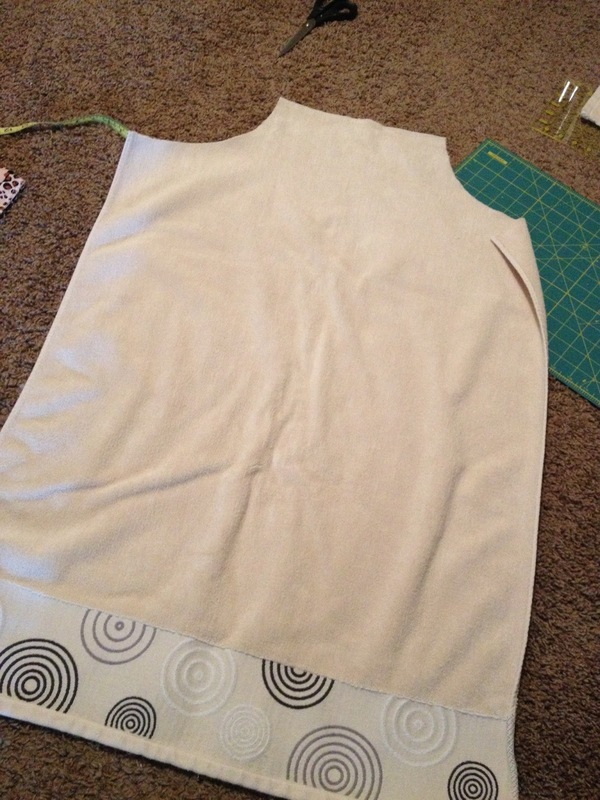 Straight stitch across the neck from the front of the apron. Repeat this along the bottom 1/4" away from the first straight stitch, and again along the top to give it a finished look. Step 6: Repeat step five for the neck and ties of the apron leaving 12-14" coming out of the top for the neck. For the free fabric (the fabric that's not attached to the towel), just fold it over 1/4" along the edge on each side, then fold it in half. 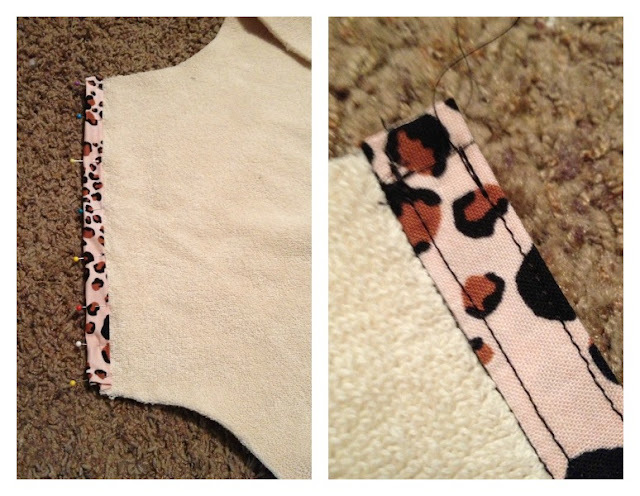 Pin in place and sew around the entire strip. 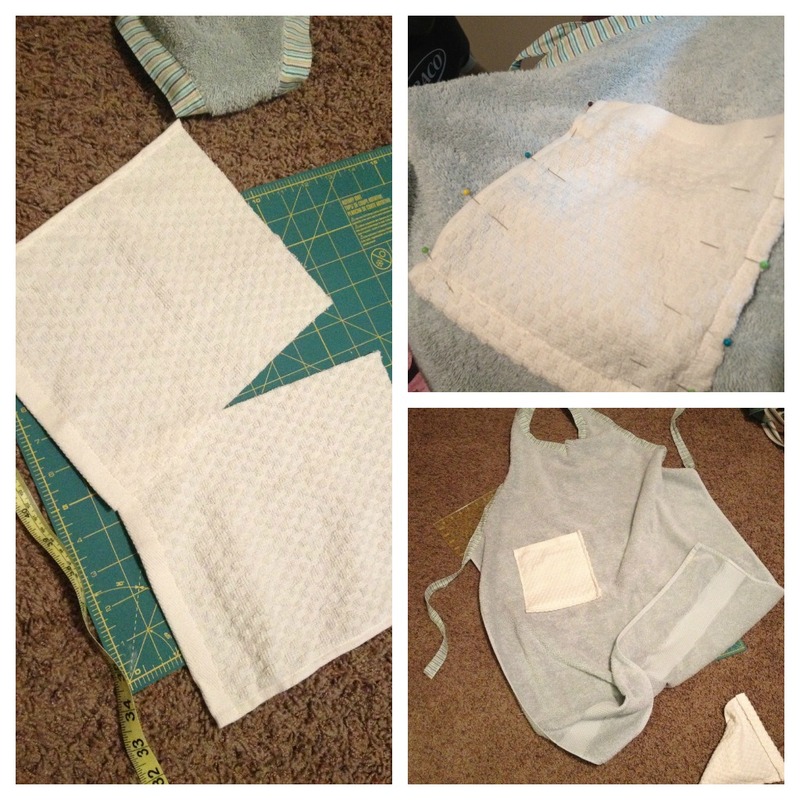 Step 7 (opt): If you want a pocket, either use a hand towel, or make your own! If you're using a hand towel, cut the towel to be 8x10". Hem the edges by zig-zagging the edge first, then folding over and straight stitching, or folding the fabric over twice then straight stitching. No exposed edges, no fraying. Try the apron on and decide where you want the pocket. Pin it in place, then sew a straight stitch along the sides and bottom of the pocket and that's that! If you're making your pocket from fabric, cut two identical pieces that are 8x9" (or however big you want the pocket plus 1 inch), place them right sides together, straight stitch around the rectangle leaving three or four inches unstitched, clip the corners, turn the pocket right side out, and straight stitch around the pocket folding the three or four unclosed inches closed. 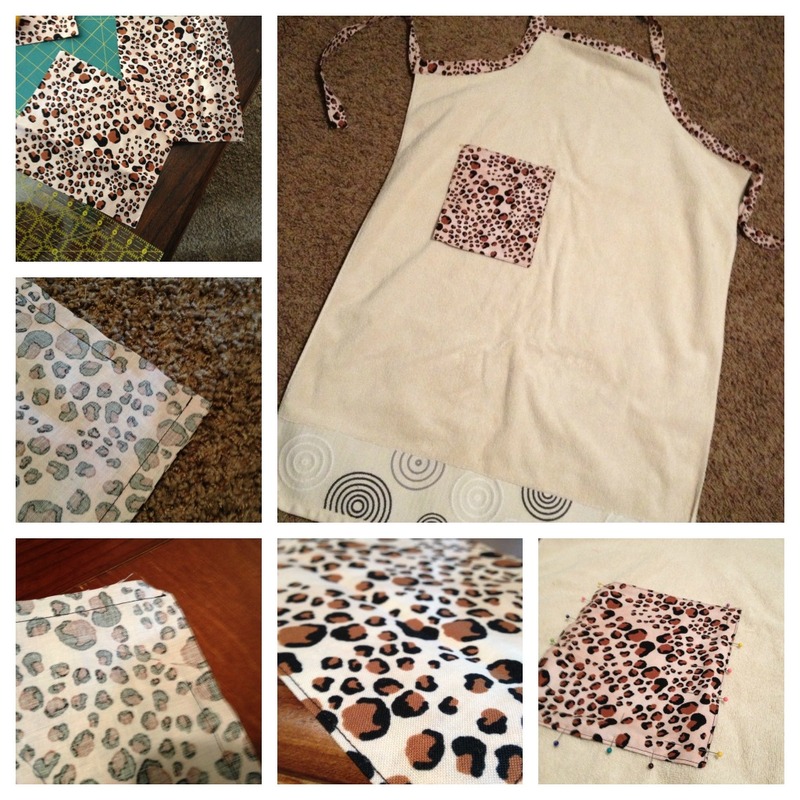 Try the apron on, decide where you want the pocket, pin in place, and sew a straight stitch along the sides and bottom of the pocket! Voila! C'est fini! The best part about this is that I was a little skeptical about it and wondered if it really would be very useful. I used it once with Chelsea and I can testify, it is useful. I like it for sure. So give it a try! But make sure you've got some Orange Juice handy. It'll make the entire two hours you spend working on it even better! 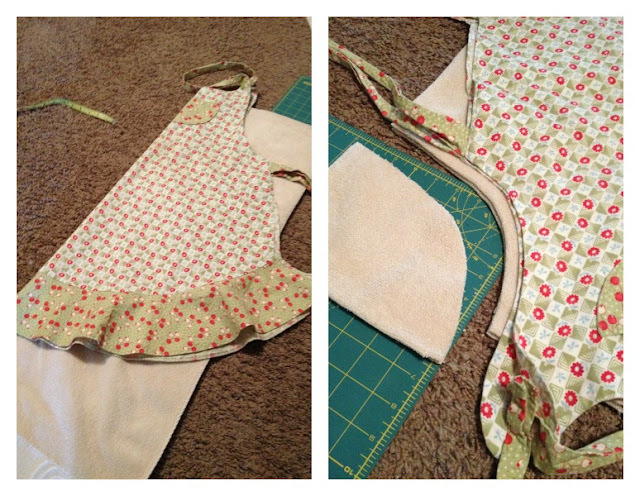 These towel aprons are also available in my Etsy shop. Be sure to stop by and see what's available.